Are you looking for homeschool freebies? We have created the following homeschooling freebies just for you! Are you overwhelmed at the thought of choosing a home school program from the many that are available? Choose programs for preschool, kindergarten and high school! 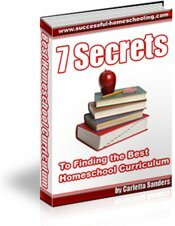 Download 7 Secrets to Finding the Best Homeschool Curriculum by clicking on the image to the right or the link below. Are you looking for ways to save money on homeschooling? 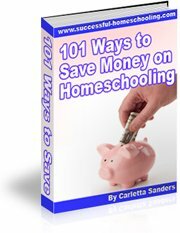 Sign up for our homeschool newsletter, and receive your FREE e-book, 101 Ways to Save Money on Homeschooling. how to earn income from home. ✔ Simple strategies for planning your purchases. - I'll show you how to see through the slick sales pitches and advertisements, so you don't waste money! ✔ A list of places where you can find discounted or free curriculum. - You'll learn where the even the thriftiest homeschoolers go to purchase books and curricula. ✔ Out of the box ideas for saving money on field trips and activities.- You don't have to forgo lessons and outings. You may be on a budget, but you can still have fun. ✔ Tips you can use to trim your household budget and earn income from home. - Learn how to reduce household expenses without feeling deprived. updates about what's new at Successful Homeschooling! Subscribing is safe and simple. Just fill in your name and e-mail address below. In a few hours, you'll receive an e-mail asking you to confirm your e-mail address to be sure no one submitted it without your knowledge. You will then receive a link where you can download your FREE e-book, and the next issue of Successful Homeschooling will be delivered directly to your e-mail address.